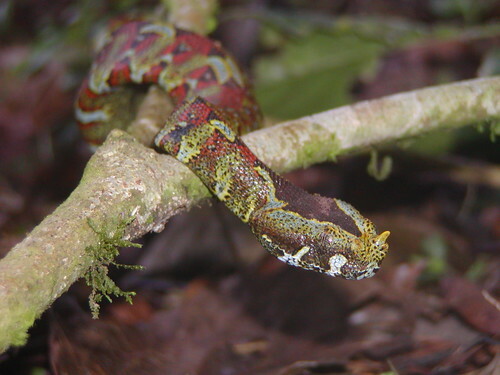 The rhinoceros viper is one of two large venomous vipers found in the TL2 “landscape”. As usual, in Ubundu I stayed at the Catholic parish guest house. Yesterday, when I was dismayed because a harmless snake was killed on church grounds by one of the parish staff, the curée told me about a local boy I would find interesting. The next morning, after mass he arrived at my door with a young man he introduced as Likuta, the snake boy. Likuta returned the next morning with his brother, carrying two tubular cages of woven rattan, and a hollow bamboo stem, all containing live snakes. Likuta and his brother opened each cage dumping three live gaboon vipers on the ground in front of me. The snakes were torpid and the boys handled them casually, picking each of them up by their mid-section to show them to me. 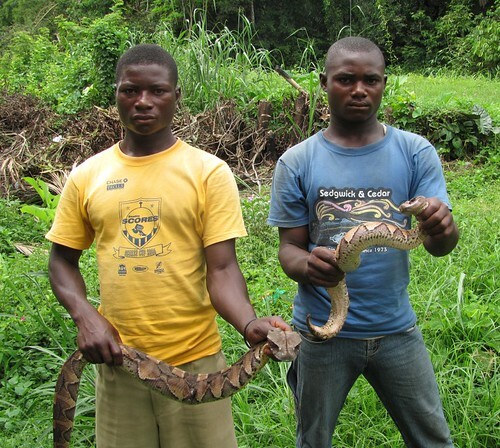 Likuta and his brother holding two of his gaboon vipers. Likuta told us that he had kept the biggest of the vipers for eight months already, and that the snake ate one to two young house rats a week. The smallest, which he kept in the bamboo stem, was a voracious feeder with a preference for live fish. 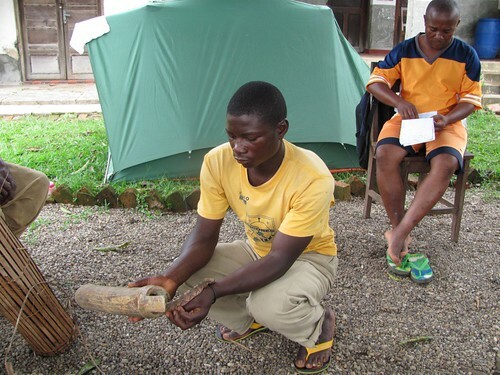 Likuta explained that he first began handling snakes when he was a school boy. His original inspiration was a bit mysterious. “My grandfather encouraged me,” he stated simply, though the old man had not been a snake handler himself. Likuta was clear about his current motivation. He caught and kept vipers in the hope of eventually selling them. Some time back he had met a man from Kisangani who had mentioned an interest in buying gaboon vipers. The man had never returned. When I explained our interest in discovering what kind of snakes lived in the forests of the TL2, Likuta was genuinely interested. He described how to hunt arboreal snakes in trees, and how once he had found a python with a girth equal to his leg. “That one was too big to bring back to the village so I let him go” he explained. Anyone willing to take on a herpetological survey of the TL2 will find a ready collaborator in Likuta. Likuta with the smallest of his gaboon vipers. Maurice, on the right, is camped out on the church lawn. Final note: Wikipedia reports that the Gaboon viper, Bitis gabonica, is not only the largest member of its genus but it has the longest fangs and the highest venom yield of any venomous snake. Even an average bite from an average sized specimen is potentially fatal. Both the gaboon viper and the rhinoceros viper (Bitis nasicornis) live in Africa’s central rainforest and are found in TL2. This entry was written by Terese Hart, posted on 2010-12-15 at 5:08 am, filed under uncategorized. Bookmark the permalink. Follow any comments here with the RSS feed for this post. Post a comment or leave a trackback: Trackback URL.